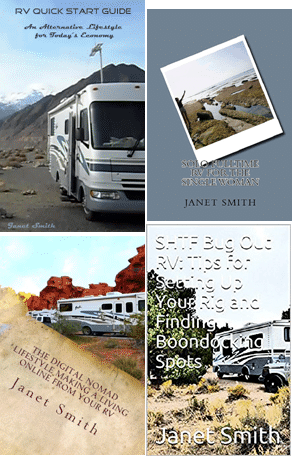 I have written four books to help you get started in the RV lifestyle. Below are links to purchase on Amazon as a paperback and Kindle, and also to Etsy, where these books can be downloaded as PDFs, which can be read on any computer, as well as Android, iPhone and iPad. I have also supplied links to the Apple iTunes store to download to your iPad or iPhone. Are you sick of paying rent? Unable to buy your own home? Facing eviction or foreclosure? Or do you simply want the freedom to move freely or travel? Then living fulltime in an RV might be for you! This book was written by a single woman who quit her day job, and did just that. 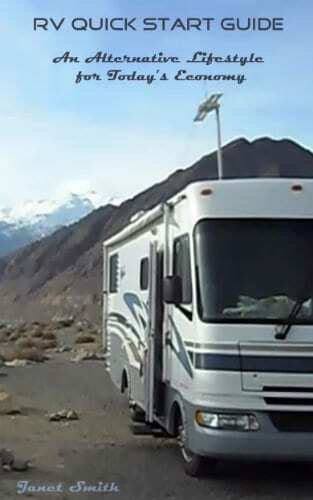 It’s designed to help you get started; help you decide which type of RV is right for you, some of the basic workings of living with an RV, finding places to park, and also, ideas on how to earn a living on the road. 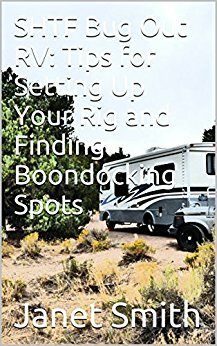 Get RV Quick Start Guide on Amazon as a paperback or Kindle. Get it as a PDF download at my Etsy shop. Do you dream of making a living on the road, as a digital nomad? I made that dream happen, and I’ve been doing so for a few years now. In this book, I will give you the formula I use for building your online income, including different free resources you can use to produce and market your digital products, as well as information on staying connected on the road, and an overview of the different types of RVs. I hope this booklet provides you with some ideas, and a starting point for your journey! 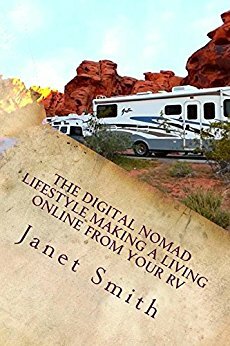 Get Digital Nomad Lifestyle on Amazon as a paperback or Kindle. As a single woman, have you ever dreamed of living independently, travelling across the U.S.A. in a motorhome or travel trailer? Are you afraid to do it, alone? I have been “living the dream”, and you can too! 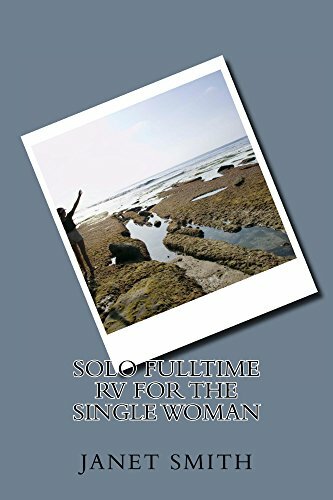 In this book, I will cover the basic essentials, for you, as a single woman, to get started living the RV lifestyle! Get Solo RV Woman on Amazon as a paperback or Kindle. SHTF Bug Out RV. You may have hit upon hard times, or maybe, you are distressed by current politics, and feel the need to prep and bug out. Perhaps you sense the End Times coming. Or maybe you are the adventurous type, who wants to experiment with living off the grid. I’ve been living this RV lifestyle for a few years now, and I’ve set my rig up for bug out the best I can. I planned for it, and I hope to help you plan for it too, not only in the nuts and bolts sense, but mentally and emotionally. There are no guarantees in life, but you can hedge the odds with planning, and a serious dose of personal truth and honesty. Get SHTF Bug Out RV on Amazon as a paperback or Kindle.